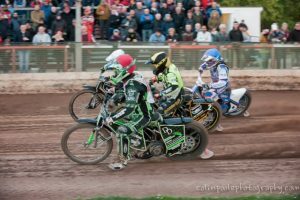 Redcar SG Petch Bears made it 2 wins from 2, with an excellent all round team performance to beat the Ipswich Witches 54-35 on Thursday night at the Media Prima Arena. Every single Bear registered at least a paid win, but the night was marred with an injury to Ipswich rider Nico Covatti in heat 12. Covatti and his team mate Danyon Hume came together going into the third bend, with Covatti coming off worse and receiving lengthy on track treatment before being transferred to hospital. Our best wishes for a swift recovery go to him. The meeting started off badly for the Bears, with the Witches securing a 5-1 but it was the only time Ipswich led as 2 quick 5-1s for the Bears gave them the lead they never relinquished. Jason Garrity and Ben Barker top scored for the Bears, and handed the Bears two big 5-1s in heats 13 and 15 to secure. Charles Wright and Jonas B Andersen had strong nights as well, and Coty Garcia had his best night as a Bear and recorded a great heat win along the way. For the Witches, Rory Schlein top scored with Nico Covatti having a good night before his injury. A very good result against a much fancied team. We dug deep and we had the bonus of Coty Garcia chipping in with some great points. Good team performance all round cheered on by a good crowd. I’m a happy promoter! The Bears have a busy weekend ahead, with a trip to Edinburgh tomorrow night before the long trip down to Ipswich on Saturday. Bears to ride on Friday nights!